Islamic Minister Louis Farrakhan, 79, leader of the Nation of Islam in the United States for over 42 years, arrived in Belize City this afternoon on a six-day tour, coordinated by Nuri Muhammad, a former imam in Belize. The media was invited to a press conference, but was strangely excluded from an interview given exclusively to the Government Press Office at the VIP Lounge. 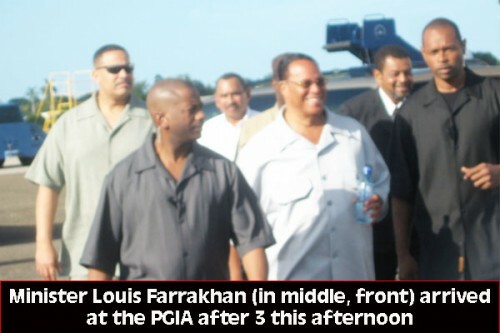 In fact, KREM and other private media had to interview Farrakhan through the chain link security fence. Afterwards, Farrakhan called on Belize Prime Minister Dean Barrow at his Coney Drive, Belize City office. This is Farrakhan’s third visit to Belize. Farrakhan also visited Belize in 1975 and 1986. “I am very happy to be back again after 27 years and I’m looking forward to meeting as many of [the] people of Belize in [the] 5 or 6 days that I shall be here with you,” Farrakhan told the media on his arrival at the Philip Goldson International Airport after 3:00 this afternoon. “I am honored to be here, happy to see you all and I’m looking forward to making contact. You are what I live for,” he went on to say. Farrakhan, born Louis Eugene Wolcott, was surrounded by his security detail of about 15 persons, plus Belize police escorts. The heavy emphasis on security, our newspaper was told, was because of the position Minister Farrakhan holds in the Nation of Islam, and the assassination of former leaders such as Dr. Martin Luther King and Malcolm X. Speaking to a citizen who was waiting at the airport to welcome him, Farrakhan said that his mission in life is the liberation of his people. Farrakhan is due to appear tomorrow morning on the KREM WUB Morning Vibes show. We understand that co-host Mose Hyde has arranged a welcome for him with Garifuna drums and dancers. Following the morning show, Farrakhan is due to tour the Library of African and Indian Studies. In the afternoon, he is scheduled to pay a courtesy call on Leader of the Opposition Francis Fonseca, and then later in the afternoon, he is to dialogue with community activists on the importance of participatory democracy at a two-hour session at the University of the West Indies School of Continuing Studies. On Tuesday evening, he is to be hosted at a reception by the Belize Ministry of Foreign Affairs. Chief Executive Officer in the Ministry of Foreign Affairs, Alexis Rosado, told Amandala that the reception is a gesture of hospitality from Minister Wilfred Elrington, who wants to host Minister Farrakhan, to give him an opportunity to meet more Belizeans. On Wednesday morning, he is due to meet with the president and staff of the University of Belize before addressing the student body on their role in the development of Belize. He is planning on touring Spanish Lookout, a Mennonite community, later that day. On Thursday, Farrakhan is to visit the Belize Central Prison to address inmates. Around noon Friday, he is due to attend the Muslim mosque or masjid, where he is to deliver the jummah (congregational) prayer and address to the Muslim community of Belize. The 2012 national census estimates that there were 577 members of the Nation of Islam in Belize; however, a member of the community says the number is more like 2,000. On Friday night, the Bird’s Isle will be the venue for a public address by Minister Farrakhan. He departs Belize on Saturday, March 9. His original visit slated for 2012 had to be postponed for medical reasons, and he decided that he would extend his trip this time from 3 days to 6 days.